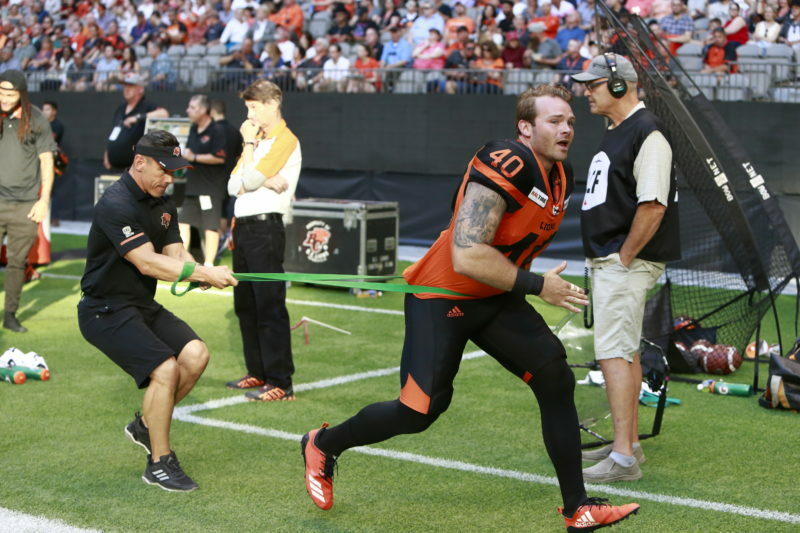 As he prepares for a fifth full season with the BC Lions, Mike Benson is busier than ever in his offseason home of Winnipeg. Along with serving as a strength and conditioning coach for a girls tackle football team, the long snapper is running three football academies that feature upwards of 30 young kids. A health and fitness buff at heart, he has also dabbled in helping a couple of other young athletes rehab from ACL injuries. However, his newest project could have a major impact on the development of athletes in the Manitoba school curriculum. As more schools in his area add it to their physical education programs, Benson is on the verge of certifying at least 20 teachers in Olympic weightlifting. After he launches level 2 of the Acceleration Performance Weightlifting program, he will have certified 50-plus personal trainers and instructors at the end of next year. “I’ve taught Olympic weightlifting seminars for a while now and last year was the first time I turned it into a certification course,” he said. Lions long snapper Mike Benson works with strength and conditioning coach Chris Boyko in pre-game warm ups. Although his number one focus remains on winning that elusive first Grey Cup ring, Benson has plans to expand his certification programs beyond his home province whenever his football career comes to an end. “As I come closer to the end of my career- which I hope to continue for a few more years- I’d like to take it on the road,” Benson explained. So far, he hasn’t shown any signs of winding down. 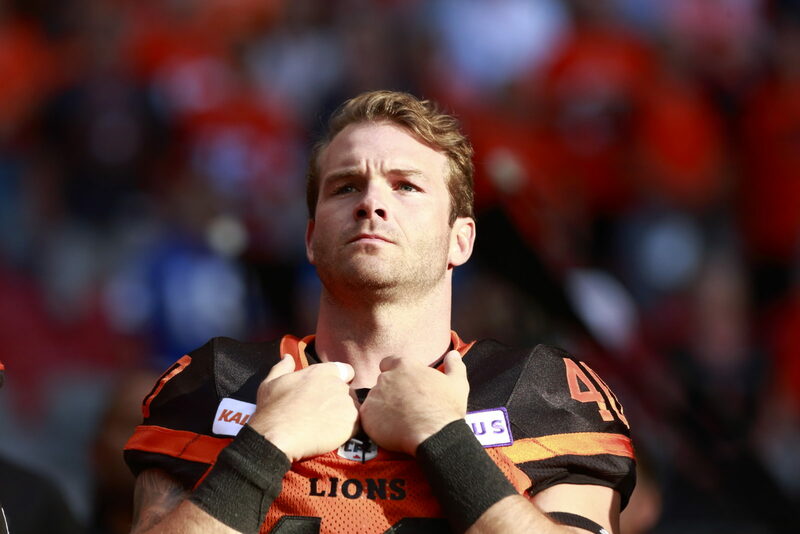 Since his arrival in the den midway through the 2014 season, Benson has suited up in 81 straight games- and to think it almost never happened after he was all set to retire and become a Youth Parole Officer in Winnipeg before the Lions came calling in need of a long snapper. Along with being a valuable foot soldier on special teams, his durability has come in handy in the development of kickers Richie Leone and Ty Long; two Americans who required a little knowledge of the Canadian game upon their respective arrivals. How much has his dedication to fitness had to do with his ability to stay in the lineup? It’s something many young players can follow. “I may be turning 32 this year, but I still have the ability to run with a 23-year old and have just as good or better mobility than most 23-year olds,” Benson said. 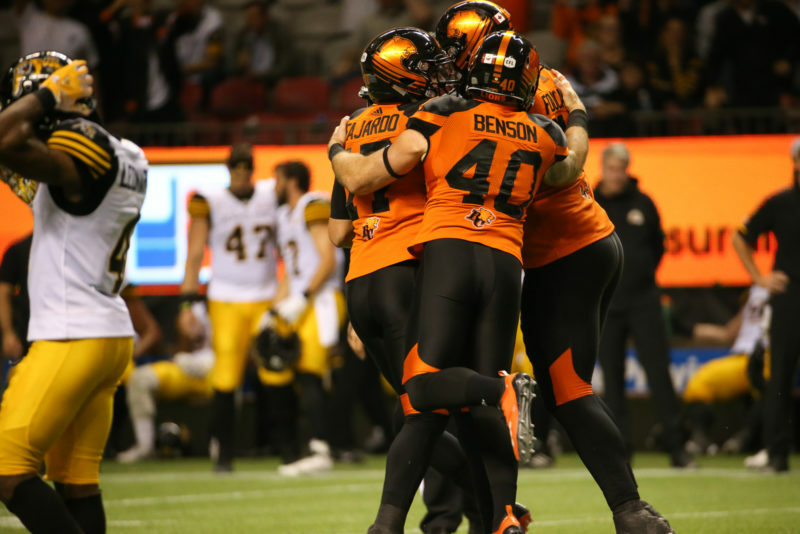 Benson, quarterback/holder Cody Fajardo and lineman David Foucault celebrate an overtime win over the Hamilton Tiger-Cats on September 22nd/2019. And you know having a new coaching staff in place will force Benson and a handful of other veterans to approach 2019 training camp like they are still trying to prove themselves after all of these years. Head coach DeVone Claybrooks has brought Taylor Altilio with him from Calgary to run the special teams. Like Benson, Altilio himself serves as a personal trainer. It should be a match made in heaven. “I’ve read up on coach Taylor a lot, but haven’t met him yet,” Benson said. The only thing that remains to be seen is what kicker Benson will be working with. Following Long’s release to pursue a deal with the NFL’s Los Angeles Chargers earlier this month, the kicking game could be one of the big question marks heading into camp, even after the squad added Tennessee State rookie Lane Clark earlier this week. Looking back, Benson couldn’t say enough good things about mentoring the likes of Leone and Long in his time here. “Neither of them would be where they are without me,” Benson chuckled. Whoever may emerge in the kicking game will be in good hands with a leader of Benson’s calibre.